Get a brilliant white smile, permanently with KöR Whitening System! Aesthetika Dental Center Blog Get a brilliant white smile, permanently with KöR Whitening System! Practically every tube of toothpaste promises to make your teeth whiter. There are dozens of over the counter products that say they can turn your dull, dark smile into one that will light up a room. Even packs of chewing gum now promise whiter teeth! And sadly, most of us have found these claims to be untrue. The KöR Whitening System procedure begins with meticulously constructed KöR-Seal™ Whitening Trays. These whitening trays fit so perfectly that they virtually seal the whitening gel inside the tray, preventing the gel from leaking into the mouth like other whitening systems. The result is more than six hours of whitening activity, compared to the 20-30 minutes of whitening activity found with other whitening systems. This allows the teeth to more thoroughly absorb oxygen from the KöR Whitening gel, resulting in amazing whitening of the teeth. The final step is a one-hour whitening (or two depending on your stains) chair-side procedure in the dental office, which kicks the whiteness to another level. More importantly, the chair-side procedure helps make the whiteness “permanent”. Within two weeks, your teeth are beautifully white. With easy, occasional at-home maintenance, the result is long lasting, and you can still eat and drink your favorite foods, such as red wine, coffee and tea. The KöR System is comfortable and 100% safe for your teeth and gums. The result is a radiantly white, natural appearing smile that you will LOVE! It’s perfect for everyone, from ages 14 to 90. Unlike other whitening methods, with easy periodic home maintenance, the KöR Whitening Deep Bleaching System is entirely permanent. The KöR Whitening Deep Bleaching System whitens teeth dramatically, often lightening then 16 shades or more. Although everyone is different, with the proper KöR Whitening Deep Bleaching System, all teeth will have stunning results. 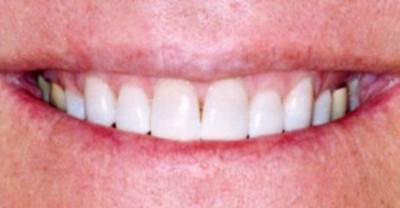 It even whitens tetracycline-stained teeth, previously thought to be impossible! No. Real teeth can’t look unnatural they just look beautifully white. If you have seen people with ultra-white, fake-looking teeth, these were probably false teeth, teeth with porcelain crowns or veneers that may have been made too white and too opaque. You’ll get the ideal shade that’s right for you. Will my crowns, veneers or filling whiten too? How does the KöR Whitening Deep Bleaching System work? First, Dr. Castaneda will make molds of your teeth so you can have your own unique, ultra-comfortable KöR Whitening Trays. Then, you’ll have a simple visit in the dental office, followed by wearing KöR Whitening Trays for two weeks at home while you sleep. The chairside KöR Whitening Deep Bleaching System is completed with a final visit in the dental office, this takes approximately two hours.